« A New Surprising Result! 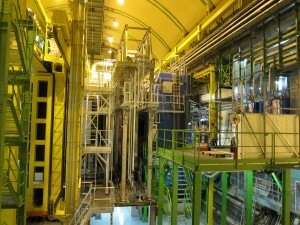 LHCb reports observation of CP-violation in charm. Welcome New Physics? Or not? One of CERN’s collaborations, the LHCb, has reported observation of direct CP-violation in the decays of charmed mesons at the Hadronic Collider Physics Symposium 2011 (HCP 2011) in Paris today. This is a fantastic news! While I am not at HCP 2011, kind folks at LHCb let me know about this fantastic measurement — since charm physics is my specialty. First things first. CP (or Charge Parity) is a set of (discrete) transformations performed on a theory’s Lagrangian — a function that describes what particles we have in a theory and how they interact. If your Lagrangian is symmetric under this transformation, then particles and antiparticles — matter and antimatter — have the same properties. If not — interactions of matter particles are different from interactions of antimatter particles. This possible difference is a crucial property of a theory because, according to three Sakharov criteria, the Universe could evolve in what we see around us only if matter and antimatter have different interaction properties. Otherwise, at best, we’d have big chanks of antimatter floating around — or at worst would not not exist at all. This is why many huge experiments built to study CP violation. Big national labs’ flagship experiments were designed to search and study CP-violation (BaBar at SLAC, Belle at KEK, LHCb at CERN), with hopes to see glimpses of New Physics that could explain matter-antimatter asymmetry in the Universe. This new result from LHCb can in principle provide one. So, what did LHCb see? The reported analysis looks at the difference of a difference — i.e. a difference of CP-violating asymmetries in kaons and pions. The CP-violating asymmetry is defined as the difference between decay widths (roughly speaking, decay probabilities) of a neutral D-meson to decay into a final state, say positive K-meson and a negative K-meson and the same quantity for the D-anti-particle to decay to the same final state. This quantity is also defined for the final state of two pions — and it is CP-violating! The structure of this CP-violating asymmetry, aCP, is not that simple. Because D0 is a neutral particle it can, in principle, mix with its antiparticle (see here) — and this antiparticle can also decay into the same final state! This process can be also CP-violating (this type of CP-violation is called indirect CP-violation). So the result would depend on both types of CP-violation! In other words, this quantity is 3.5 sigmas away from being zero. The first question that one should ask is whether this quantity is consistent with previous measurements. The biggest question, however, is whether this quantity is consistent with Standard Model expectations. or approximately so. So by subtracting those quantities we not only subtract the experimental uncertainties, but also enhance the signal! However, looking at the table on page 6 of the talk, one can immediately realize that this measurement is at least consistent with the previous ones. Is it a sign of something beyond the Standard Model? This one is hard to answer. I usually put an upper bound on the SM value (that is, absolute value) of asymmetries like aCP (KK) at 0.1% — which would make ΔaCP to be about 0.2%. Is it consistent with LHCb findings? Maybe. The size of this asymmetry is notoriously difficult to estimate due to hadronic effects. Maybe it is a sign of New Physics — this could be an exciting conclusion, as we have never seen CP-violation in up-quark sector. It is interesting that the first “big” result from LHC comes in the realm of charm physics, not Higgs searches. Moreover, all “big” results in the last decade were from the experiments searching for New Physics indirectly, in the “intensity frontier” (this is lingo of US Department of Energy) — with most of them coming from charm physics. Maybe at the very least LHC-b should be renamed as LHC-c?